A self-storage unit is a convenient way to store your personal belongings that you either don’t have room for in your home or business for, or only use temporarily throughout the year. Seasonal items, decorations and family heirlooms are some of the most commonly stored items. But a self-storage unit without adequate security measures in place defeats the whole purpose of having the unit in the first place. 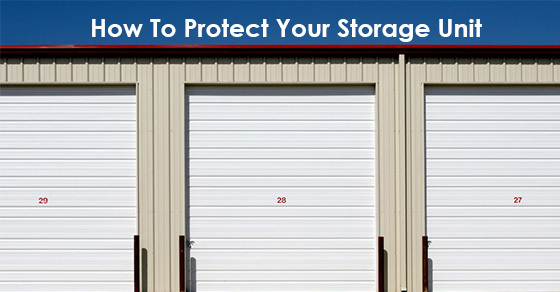 Below are five security measures your storage facility should have to ensure that your belongings are properly cared for and looked after. Strong locks. Having a strong lock means not only investing in quality, it also means selecting the right design. A lock with a short, thick handle is your best option because they are typically the most difficult to cut with bolt cutters and are the hardest to gain leverage on when attempting to force entry into your storage unit. Pack your items logically. When a thief breaks in, or attempts to break into your storage unit they are going to want to get in and out as fast as possible without being caught. Their goal is going to be to grab whatever they can, and escape with your property before being caught by patrolling security or any camera systems that have been installed. Making sure that your most valuable goods are at the back of the unit often discourages thieves, because the time required to extract them is too big of a risk. Maintain an inventory. Keeping a detailed and organized inventory of everything you have in your storage unit is not only more convenient for you, it will help you, in the event that things are stolen, to let your insurance company know exactly what needs to be replaced. It will allow you to accurately calculate the dollar value so that you can be reimbursed. Insure your possessions. This is especially important for people storing items with particularly high monetary value. If your storage unit contains valuable electronics or collectible items with considerable market value, it is worth the investment to purchase insurance so that you can rest assured if the unthinkable happens, you are not left twisting in the wind with no recourse. Choose a secured facility. All self-storage facilities are not created equal. This means that you need to carefully assess and select a storage facility that takes your property and its security seriously. It should have adequate security measures in place, including monitoring the people coming and going, as well as visible, functional security equipment that provides surveillance around the clock. People choose to store their belongings in self-storage facilities for the peace of mind that their belongings are not only out of sight and no longer cluttering up storage space in their home or business, but also for the knowledge that a team of professionals is ensuring that their property is protected 24/7. That being said, making sure that you are doing your part by putting the above security measures into place will increase the odds that thieves and stolen possessions are never issues.